There are some things in life that you only really appreciate with a bit of hindsight. For some, it's the laughter and companionship of friends they haven't seen for a while and only now realise their value. For others, it's the memory of a place they've tried to go back to, but found, upon arrival, that the golden yesteryear, no matter how irritating it may have felt to be at the time, is far better than the stark, ugly here and now. 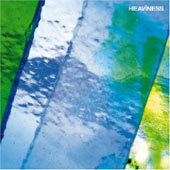 So it is with the eponymous album from Swedish band Heaviness. I used "band" to describe them, as I was tempted to call them "shoegazers", but this (quite apart from being a lazy, blanket term I don't like utilising) doesn't really do them justice. To compare yet another band to a slice of their style, I can hear the influence of that genius Kevin Drew and the rest of Broken Social Scene at work here, along with Brian Eno, Ulrich Schnauss, and whole host of almost-but-not-quite-glitchy noise shapers. I'll be frank here (as far as West Midlands Constabulary are concerned, I AM Frank, OK? If anyone asks, like...): on first play I hated this album. I sat down tonight with the intention of writing a very short, very stinging review about this CD being a simmering puddle of arse-gravy. But, no, gentle reader...with the benefit of patience and a slice of hindsight (I could remember the wash of guitar distortion which is omnipresent on this album), I sat here rather pleased with what I heard. In fairness, I do have to say that there isn't much distinction between the tracks. Heaviness seem to enjoy settling into a trench of post-rock warfare and firing the mortars at the same target time after time. But it's an interesting trench. Vocals, male and female, are mixed down to a barely audible level, so that they become just another layer of instrumentation. This is not an new trick, by any means, but like making a rabbit appear out of a top hat, it's still good to witness if it's done right. There's even a violin (although it could be a viola or the top register of a cello) sprinkled over one of the tracks. The whole feel of Heaviness is one of carefully planned lo-fi. Nothing in your face, nothing clumsy – in fact, my one gripe with this is the relentlessness of the lo-fidelity aspect of the album. It begins to wear the resolve of the listener down a track or two before the end. Imagine listing to an album through your hi-fi when both bass-drivers have blown. You can do it for a while, but eventually you crave for some bass and turn it off. Oddly, the band's finest moments tend to occur when each track is twenty or thirty seconds from the end. Some painfully melodic, ambient and haunting moments reside here, like the stragglers in some insane carnival turning out to be the best jugglers and finest poets. I found myself immersed in the tide of each track, just to see what interesting flotsam and jetsam washed up at the end. As there is so little to dissect of this album, I won't. It's a pleasant listen, with some sly engineering at work. A mark of its worth is that I'll play it again and see if I can find any more layers in it – I don't so that often, young Jedi Sponger, so heed my words. Oh...and yes...the 'Green Bengal' Indian restaurant. It used to be in Coton Lane in Birmingham and the building is now a nail salon. I always thought the place was a dive, but in hindsight, it was possibly the best Indian restaurant ever...apart from when the waiters there tried to convince my mate, Gary Price, that the bluebottle fly he found in his chicken bhuna was a "spice".